This year’s World Series of Poker Main Event Championship attracted 6,420 players, and generated a prize pool of $60,348,000. After a full week of grinding the November 9 is set, and ready to return November 8th for final table action. The winner will walk away with a staggering $7,680,021 and the gold bracelet, as well as the title of world champion. 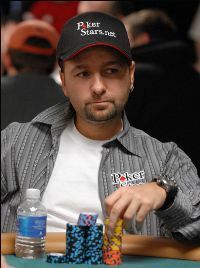 Unfortunately for many poker fans, Team PokerStars Pro Daniel Negreanu will not be in the mix. He busted in 11th place and had to settle for a $526,778 payday. It was an amazing run for Negreanu. Perhaps the most popular player worldwide, he would have added a different level of excitement and celebrity to the final table. Pennsylvania poker pro, Joe McKeehen is the chip leader, and holds one third of the chips in play. Look out for Max Steinberg though, he is the only player who has already won a WSOP bracelet. Also chalk one up for the veterans, as Pierre Neuville at the age of 72 years young, is showing he still has plenty of game left as he heads to the final table. Here’s a look at the complete 2015 WSOP November 9. One thing’s for sure, the pressure will be on come November 8th. Huge crowds, worldwide live coverage, and massive pay jumps will create an atmosphere like no other. The 2015 WSOP Main Event final table will begin Sunday November 8th at 8:30 pm ET live on ESPN.